2 Bedroom Luxury Condo w/ Magnificent Ocean & Jungle Views, Walk-to-beach! 'The Shana Residences' are a luxury condominium complex in Manuel Antonio, nestled amid the lush rainforest of Punta Quepos. Shana Residences #310 has some of the best ocean views in the entire resort, and overlooks the pool area. The condo is well-appointed with high-end furniture and furnishings--in fact, it has been recently renovated, including 2 new comfortable sofa-beds, newly refinished furniture, bed linens, and newly painted. The living area, dining area and kitchen all communicate with each other, and with a fantastic outdoor covered balcony--which is the perfect spot to relax after a day of fun activity. The master bedroom has a king bed, a queen sofa bed, a large walk-through closet and huge bathroom. The guest bedroom also has a king bed, walk-through closet and large bathroom. Every detail provides the maximum comfort--from the mattresses, sheets and duvets--to the familiar coziness of the kitchen. The Shana Resort is located in what is perhaps the most pristine and tranquil area of Manuel Antonio! It is located just minutes from the main public beach, Manuel Antonio National Park (one of Forbes magazine's '12 most beautiful national parks of the world'! ), and main public beach. There is also a beautiful cove beach just 10 minutes walk away- Playa Biesanz, where the waves are smaller and you can rent beach chairs, kayaks and paddle boards. The Shana has it all: a huge pool and Jacuzzi, sunning terraces with day beds, a contemporary lounge area, bar, restaurant, and 24 hour security. You can even hire your own chef, or have a massage therapist come directly to your condo! From your doorstep enjoy five star restaurants and world renowned Spas....wildlife, tropical gardens, expansive views, romantic settings, exciting adventure tours and so much more! Book a vacation of a lifetime! The owners, Tom and Don are brothers and property owners living in Los Angeles and Denver, respectively. When you make a reservation, we will put you in touch with our local reservations manager, Nicole Bastian. Close to Pacific Ocean beaches, close to Manuel Antonio National Park, beautiful views from the property, day trips easy to arrange including fishing, canapy tours, mangrove tours, white water rafting, hiking, swimming, sunning, learning Spanish, etc. Some of the best ocean views at The Ocean--overlooking Bisanz beach and cove, Quepos Point, 60 miles of coastline, and the distant Talamanca mountains! Brand new 30MBps fiber optic connection with wifi mesh system! There is an adjoining dining area near the living room and kitchen area. Fiber optic HD TV with local channel package. Had the opportunity to spend most of the week in Shana 310. Me, my wife, and two kids (11 & 14) had plenty of room in the unit. Kitchen was updated and had everything we needed for cooking. A reserved parking spot was there for us right outside of the unit all week. 10/10 for cleanliness, and a full cleaning was provided mid week. We saw monkeys, toucans, and lots of birds all week. The path to the ocean was not bad at all, but I would recommend some type of watershoes as the beach was a bit rocky in the water. The master bathroom could use a little love, as the paint is pretty beat up, but other than that, not a bad word to say. I wouldn't hesitate to recommend 310, or rent it again. We had such a great time in Manuel Antonio! 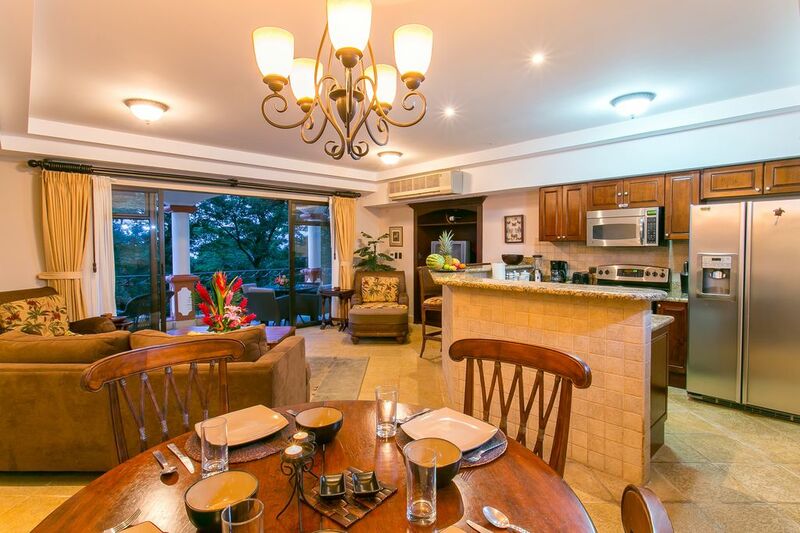 This condo at the Shana Residences surpassed our expectations. It was spacious and nicely decorated. Everything we needed was there. The management team were excellent and helped us with tips on places to go and things to do. The views from the terraces are breathtaking. And we saw a lot of animals from the terrace. Definitely will plan to travel here again and stay at this condo! The condo was functional but it is a bit outdated. It did have everything we needed and the booking agent was very helpful. Our biggest complaint was the beach access. The walk is very steep down a long rocky trail. Going down was bad enough but coming back was torturous. When you get down there you find out that they are charging $20 to rent a chair that you could probably buy for $10. This is a lovely area of Costa Rica but because of the topography most of the hotels and resorts are a long way from the beach. Stayed here for 3 nights while on vacation in CR with family (including kids under 10 years old). The condo was very nicely decorated - think Tommy Bahama's style - with solid furniture and very comfortable beds. Kitchen was fully stocked with all necessary cooking supply. The unit was clean and tidy and extremely spacious - walk in closets, full sized en-suite bathroom, balconies for main room and both bathrooms. Each room has independent AC unit so we were able to keep bedrooms cool at night. The hotel is located at the bottom of a hill - which could be a bit of a challenge driving at night as the road is quite narrow and windy. But other than that we have no complaint about the location. The view from the condo is gorgeous; there is easy access to a quiet beach (requires hiking down a pathway about 7-8mins); on site restaurant has very good food. We also enjoyed the hotel pool daily. Overall we had a great time staying at the Shana's Residence, and thoroughly enjoyed this condo unit. Our correspondences with the property manager and also with Vanessa were super easy and also very timely. We'll recommend this property to anyone staying in this area. We loved our stay here at Shana. The condo was big and beautiful for our family of five. We loved that it was off the beaten path a little bit and loved the close private Biesanz beach. Manuel Antonio is the ONLY destination along Costa Rica's Pacific coast with EVERYTHING you might want to do during your trip--with the exception of see a live volcano! (No complaints...) The only two rivers commercially rafted along the coast are out of Quepos / Manuel Antonio.